Although there is huge variety and models available, 9mm pistols are much popular. These are one of the most used among masses and U.S. Military (9mm Beretta M9). To make sure that your 9MM pistol rewards you with smooth operation (whenever you need), you essentially require to inspect it and keep them clean always. The good you care for your pistol, the best it will care for you! And for this reason you should consider cleaning your pistol after each shot you have made (whether for sporting or for any other purpose). The reason for the maintenance of a handgun on a regular basis is that every time the trigger is pulled the sediments get deposited which destroys the metal at a slow but steady rate. Removal of dust and grease (as well as gunpowder) that clogs the handgun and hampers its smooth functioning, is therefore an essential step which should not be ignored. Cleaning your 9MM pistol can be a time-consuming process and needs practical knowledge as well as bit of experience. Cleaning of your pistol basically includes cleaning of barrel and action so that there is not any gun powder residue left behind. It is more than just lubricating your handgun and making it look nice. Safety is the vital element that should be on your mind when handling your pistol or handgun. Therefore the very first step should be to unload the gun. Eject the magazine and make sure that your pistol gun has been unloaded properly. After unloading your gun, disassemble it carefully. For this you can take the help of your firearm owners manual which can direct through the process. After you have disassembled your pistol, take out the wire brush attachment from your pistol cleaning kit. Attach it to the end of a gun cleaning rod and then insert the rod into the pistol barrel. To completely clean all the accumulated carbon residue and debris, move the brush back and forth 4-5 times. Now take the loop attachment from your kit and insert a pad into it. Attach its tip to the end of cleaning rod. After applying bit of gun oil to the pad insert it into the gun barrel. By moving the pad back and forth inside the pistol barrel clean and oil up the barrel properly. Now scan the barrel using a dry patch and sop up the remaining gun oil. Using gun lubricant put a light coat of final patch. Make sure that you use the best gun cleaning solvent and oil. Dip a nylon brush in solvent oil and clean your gun around the moving action parts. Rub down the actions and other moving parts using a clean cloth and a few amount of lubricant. Bolt and the safety equipment can be cleaned this way. Ensure the barrel is clean of debris. And now when you have finished cleaning, reassemble and put the pistol parts together according to the owner’ manual. As there are variety of manufacturers who sell gun cleaning kits online, finding the best one for cleaning your 9mm pistol can be challenging. Below we have listed down the 3 best options for you to check when you want to buy a best 9mm gun cleaning kit. 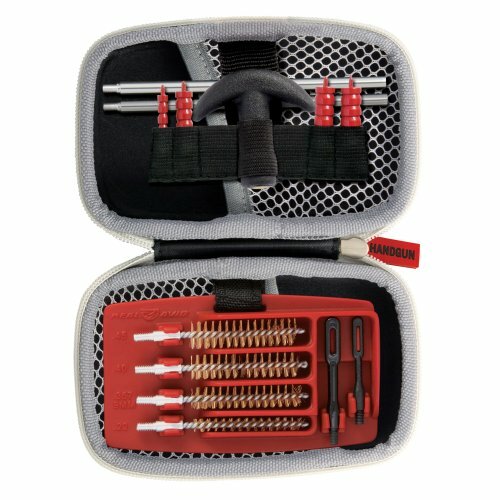 This multi-piece kit provides all the necessary tools you need to clean your 9mm. Specifically designed for .38, .357, and .9mm pistols, this great set comes packaged for your convenience. Where Hoppe’s really excels is in the value it brings. The kit is currently available for at a very low cost, making it one of the best options for those on a budget. Additionally, it features an extra stiff brush that makes cleaning your 9mm incredibly convenient—even if you’re a beginner. For those looking for a replacement brush later, standard-sized Hoppe’s brushes are compatible with this kit. The package, however, does present some drawbacks. Mainly, the plastic storage container the kit comes in is incredibly-cheaply made and offers minimal protection for your tools inside. You’ll probably have to upgrade to a better box or carrying case if you plan to use this product long-term. Overall, it provides the essential tools you need at a great value. Kleen-Bore’s Classic Handgun Cleaning Kit is an essential starter kit for those looking for the basic tools needed to clean their 9mms. The first thing users will notice about Kleen-Bore’s kit is that it comes in a fairly-sturdy case that makes it convenient for travel. Unlike other kits of a similar price that offer flimsy plastic cases, Kleen-bore goes the extra step with a hard polypropylene storage case, meaning you can take your kit on the go. The inside of the case provides a neat storage organizer that helps keep tools in place as you carry them. This offers extra protection for your tools. While the kit provides everything you need to get your gun clean, there are some things to keep in mind when using it. Because the cleaning rod is metal, be careful to not scratch your gun while using it. Additionally, make sure that the solvent’s cap is securely stored, as it has been known to leak inside the case. 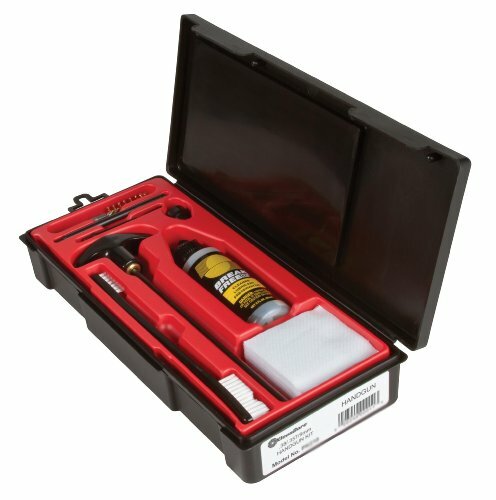 Overall, this Kleen-Bore kit requires a little extra care but gives you the tools you need at a great value. This professional-grade 9mm cleaning kit is a heavyweight in the industry. If you’re looking for proven quality, the Otis 9mm Cleaning Kit is for you. The kit is a step up over smaller starter kits. 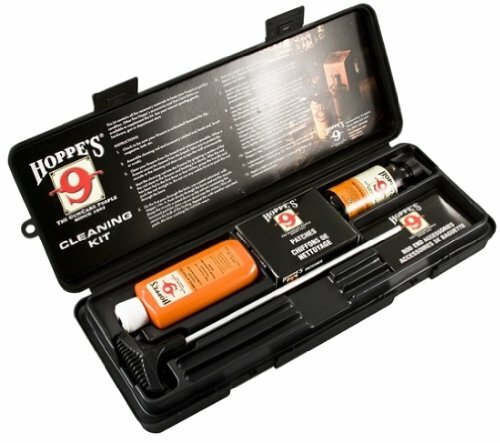 Designed for those who are familiar with gun cleaning, the Otis 9mm Cleaning Kit gives great gun-cleaning flexibility. With the tools provided, you’ll be able to get that great clean you’ve always wanted. This multi-piece kit also includes an all-in-one cleaner solvent, making it easier to get a great clean every time. Additionally, this kit comes in a compact storage case that makes it great for those who like to travel. Perhaps most importantly, however, is the fact that this kit offers a superior clean. The cleaning patches are well-made and offer a better clean than those found in other, more basic kits. Even better, the patches are made to be used several times, meaning you can get more bang for your buck. Do keep in mind, however, that when it’s time to buy replacement patches, they will run more than those of average quality, but the upgrade is definitely worth it. If you’re a serious gun lover looking for a real cleaning kit, then Otis is for you. If you’re looking for a gun cleaning kit that provides the ultimate balance between quality and affordability, the Real Avid Gun Cleaning Kit. This powerful kit offers big-name results at little-name prices. 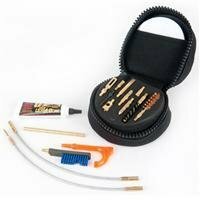 Great for beginners and for those with a little more experience, the Real Avid Gun Cleaning Kit offers all the tools you’ll need to get a great clean. Best of all, this kit comes in at very affordable price delivering a great value. The Real Avid Gun Cleaning Kit’s durable brushes come with swivel tips and the ability to reach nine inches into your pistol for serious cleaning ability. Its compact nylon case is great for protecting your important tools so that you never have to worry about them breaking while on the go. The kit’s nylon tools provide greater durability than cheap plastic so that you can enjoy superior results and easier cleaning every time. This user-friendly kit is perfect for routine cleaning. Its only drawback is that it doesn’t come with its own solvent—meaning you’ll have to look elsewhere to get additional materials you’ll need for cleaning. Overall, however, this is a great starter kit for 9mm pistol cleaning. The UTG 9mm Cleaning Kit is the perfect lightweight alternative for those looking for a starter cleaning kit. Retailing at a very affordable price, this comprehensive kit provides the tools you need to do perfect routine cleaning on your 9mm. All tools provided are made of long-lasting durable materials that offer superior ease and gun-cleaning convenience. What really sets the UTG kit apart is its size. It comes in a compact case so small that you’ll have no issue carrying it with you to the range or anywhere else you’ll need to go. What’s surprising about it is the fact that while it’s less than $15, the tools are durable and sturdy, with extra spiraled protection to keep brush threads from falling off while cleaning. The kit provides all the tools you’ll need to clean your gun. Its simple design makes it perfect for beginners who are in need of a starter kit for their 9mm pistols. Its one drawback is that the rods don’t swivel, which might make it more complicated to use for some individuals. This means you’ll have to take extra care while cleaning your gun not to scratch it. Overall, however, the kit offers an unbelievable value for the price given. Used correctly, it can help you get the clean you need every time. 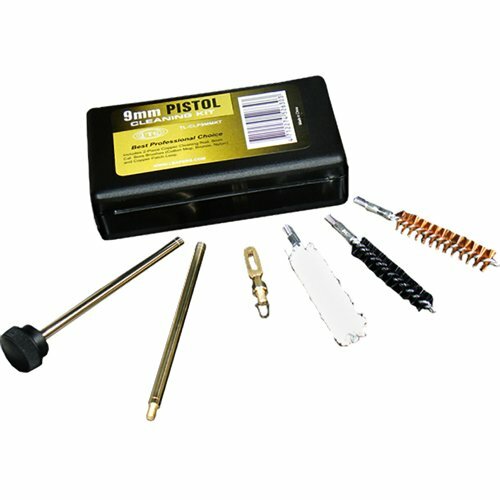 Overall, all these gun cleaning kits for your 9mm pistol are great to use. Based on your requirement and usage you can choose the one to clean your 9mm pistols, revolvers and handguns at home.